When August ends, summer comes to a close and back to school season begins. But don't panic if you put off your Japanese studies all summer. Instead, take a look at some new Japanese learning resources to get back in the student-groove. That's right, it's time again for a new batch of Japanese learning resources to help you learn, study, or improve your Japanese language skills. This month we have killer Japanese apps, one of the best games you'll play this decade, and some adorable discussions you can use to test your listening skills. Kicking off this month, we have an amazing little app called TangoRisto that helps you read news and learn language in context. Pulling material from both NHK News and Hukumusume, it allows users to make the most of their reading experience with unique features, customizable vocabulary lists, and easy Japanese dictionary lookup. 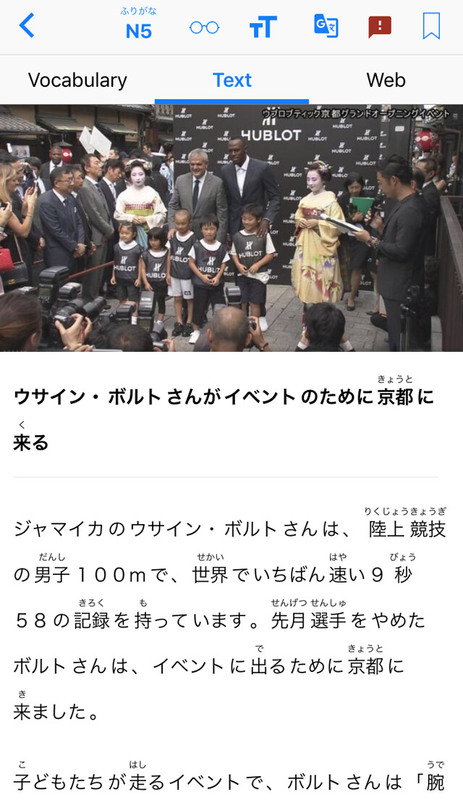 NHK News Easy is Japanese news written for kids – think of it as "Baby's First Newspaper." Hukumusume is a site with folktales and spooky stories aimed at Japanese children. When you choose an article, it's presented in text format, though you can look at the original web version (it's not pretty, don't do it). You can also choose to view all the vocabulary words with their readings, English meanings, and the number of times they appear in that article. Clicking on a word in the text will highlight it in pink, bring up a Japanese dictionary from the bottom of the screen, and include the JLPT level. All other instances of the word are also highlighted in a lighter pink. Words can be explored even further, showing parts of speech. There's even external linking from the word to other dictionaries like Jisho.org and Tangorin, plus good old Google Search, Google Image Search (very useful! ), and Japanese Stack Exchange. These words can then be added to a "Saved Words" list, which you can either study at your leisure or add to a third-party SRS tool like Anki. Warning: TangoRisto gathers its information (text, dictionary entries, JLPT levels, etc.) automatically from various sources, so there are issues. Many vocabulary words lack JLPT level classifications (even super simple words like お 寺（てら） or イベント). This isn't completely the fault of the app – the Japan Foundation hasn't released "official" JLPT lists since their revamp of the test in 2010. Also, if you click on a person's name, the app has trouble. For example, trying to get a definition for a name like ウサイン・ボルト (Usain Bolt) gives you nothing for ウサイン and "volt, bolt" for ボルト. For native Japanese names, instead you get individual kanji definitions and no indication that the word you're looking at is, in fact, someone's last name. This is a really common problem with automated apps – so while it isn't a huge drawback, it is a bit disappointing. 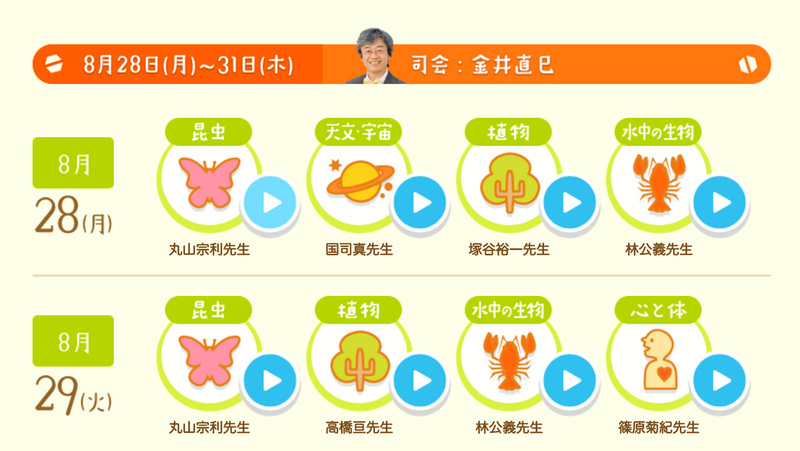 All in all, TangoRisto a fun app that can make learning with sites like NHK easier. But it does have some flaws, that will hopefully be improved upon with time. 夏休み（なつやす　） 子ども（こ　） 科学（かがく） 電話（でんわ） 相談（そうだん）, which can be translated literally to "Summer Kids Science Phone Discussions" is a show produced by NHK every summer where Japanese kids call professional scientists and ask their science questions. This summer's episodes have just ended and they're available online for free! Children are asking the questions. That means the language is simple. You're getting a professional answer presented in a way that's easier for kids and new language learners to understand. Topics are science-based, which means they cover things like bugs, animals, space, nature, emotions, and the human body. A lot of the vocabulary you learn early on in your Japanese studies probably falls into these categories. All those noun lists you've been memorizing can be put into practice here. Discussions are short, usually around five minutes. This makes them easier to grasp. And listening to short recordings a few times over is interesting instead of time-consuming or stressful. These are real kids asking real questions. None of the conversations are scripted, so you can hear how people really speak. It's nice to listen to carefully paced, simple Japanese when you start out, but it's important to graduate to real conversations as soon as you can. This series is a gentle door into the world of using real Japanese. Why can parrots and mynah birds talk? Can they understand what they're saying? Why do I have to wear underpants? Why does Earth have oxygen when Mars and other planets don't? Can you eat cicada shells? These recordings are fantastic for late-beginner and intermediate learners. Younger kids, usually those around five years old, ask cute, sometimes funny questions (like the underpants one) while older kids ask more complicated questions about space, weather, and robotics. But all the questions are interesting and legitimate in their own right. If you're in Japan and someone asks, 「どうして、パンツははかないといけないのですか？」 you better have a good answer. Unfortunately, there are no transcripts available (at the time of this writing) so you'll have to rely on your listening skills only. But that can be a major boost to your studies, because you can't cheat. You can't trick yourself into thinking you understand the audio by looking at the English answers. You have to rely on your own listening skills. And if you're working with a Japanese professor, tutor, or have some native friends, try to ask them questions about each episode in Japanese instead of English. It's a great opportunity to start listening and speaking sooner rather than later. Playing a game in Japanese that's localized from English instead of a straight-up native Japanese game is a much easier task for the Japanese learner. By now, you've probably heard of the phenomenon that is Undertale. If you haven't, please do yourself a favor and go buy it and don't look up any information on it before you've played through the entire thing. Did… did you beat it? Okay good. We can continue. Undertale is an amazing game. So amazing that when people don't like it, every single fan dies a little inside and has to fight the urge to tell/teach/scream at them about how they can't possibly feel that way. Not only is the game now available on PS4 and PSVita, but both those versions, as well as the original Steam (PC) version, have a Japanese localization. Just go into your settings, switch to 日本語（にほんご） and voila! You get a carefully supervised (by the creator) Japanese language version of a character, dialogue, and joke heavy game. Playing games in Japanese isn't just fun, it's great for your reading ability. Everything you read gives you insight into what you can and should do, and your choices are literally the most important catalyst in the world of Undertale. Understanding what you're reading is key. If you've already made your way through the Legends of Localization series of books (which we reviewed in February and July), this is a perfect next step. If you've played Undertale before, you can think back to situations and conversations from the English version and how they do or don't change in Japanese. And if you've never played the game before, you'll have to change your language back to English (or look it up online) if you really can't figure something out the old-fashioned dictionary way. But all in all, playing a game in Japanese that's localized from English instead of a straight-up native Japanese game is a much easier task for the Japanese learner, especially if your goal is to play Japanese games. And no matter what, Undertale is a great game. Some of the localization changes are really interesting and fun. What better way to replay or introduce yourself to the game? Sometimes we learn about an update to an old resource or just discover something new about one we've already covered. In addition to this month's selections, here are two updates to previous resources that may tickle your Japanese learning fancy. 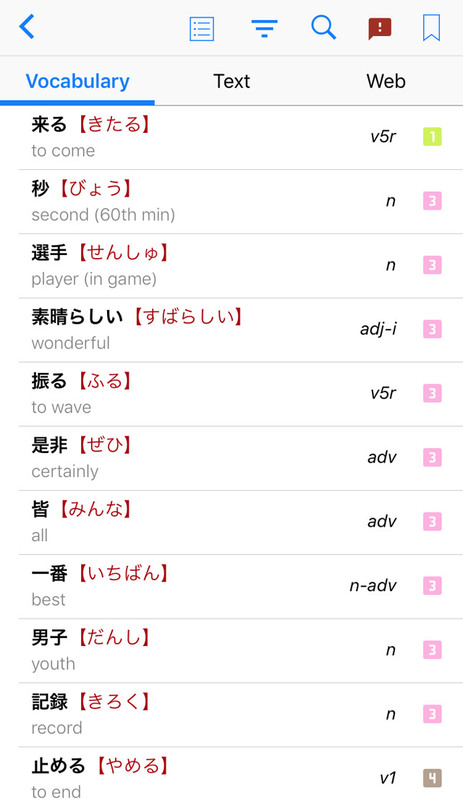 There are tons of Japanese reference and learning apps out there, so if this one looks familiar to you, don't worry. That's because it isn't new at all. It's been around on iOS since 2008. But Japanese has undergone some major changes recently and is now the shiny, new version 4! 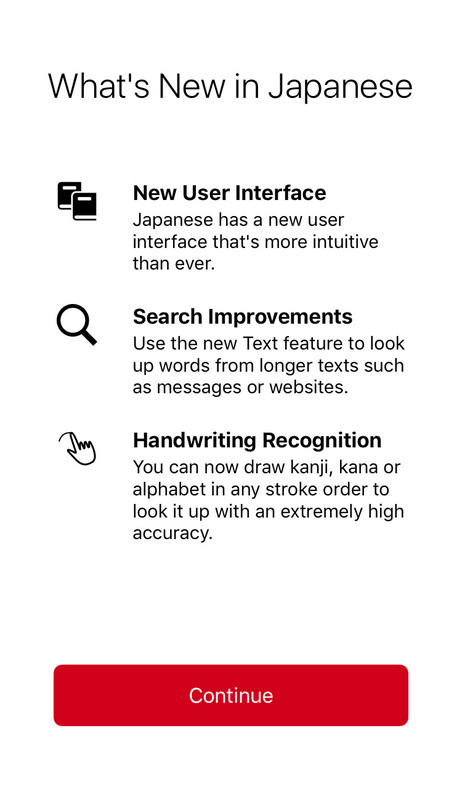 Built-in Japanese-English dictionary with keyboard, touch handwriting, and radical lookup support. 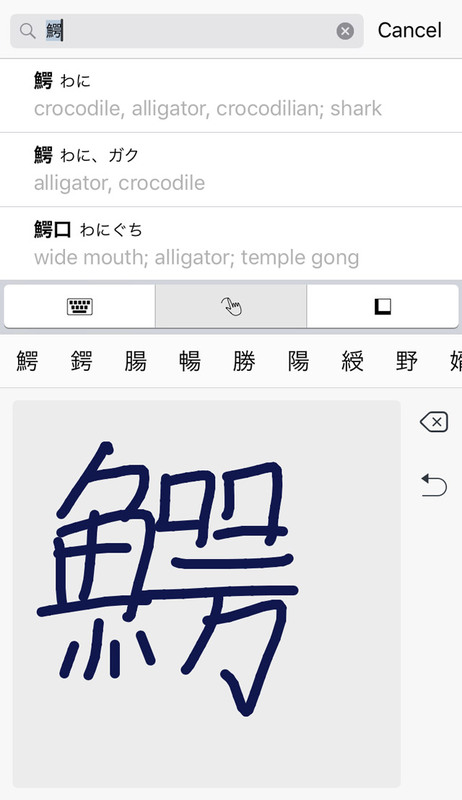 Dictionary entries with furigana, romaji, English meanings, parts of speech, kanji breakdown, example sentences, common compounds, JLPT level, and the ability to add your own notes to (pretty much) everything. Text section for looking up longer selections of text, which then links to the built-in dictionary. Lists showing your browsing history (what did I just look up?) as well as your own notes. The ability to turn any piece of info into a flashcard! No Anki needed. So what's new about it? The entire back end, which makes the app faster and smarter. The handwriting search feature and text reader tools were introduced with this version. And they've improved their SRS algorithm too, making it similar to Anki. You can read more about the changes on the Japanese blog. 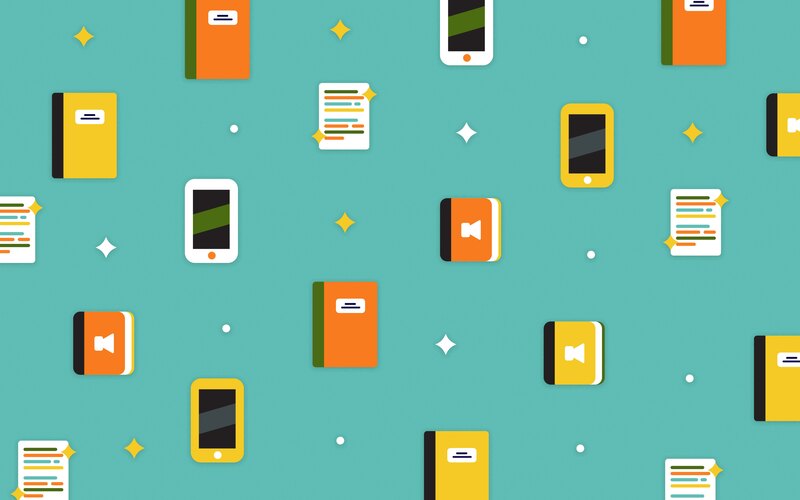 Basically, the app continues to be a one stop shop for all your basic Japanese study needs – it could potentially replace two or three apps you currently use. Pretty convenient! Remember a month ago when we were super excited for the first three in a set of graded readers in the popular Kodansha Kanji Learner's Course? Well hold onto your butts, because Volume 4 is already out as of this month! The graded reading sets are meant for people already using the KLC book. Graded readers only increase the difficulty +1 of what you already know. Vol. 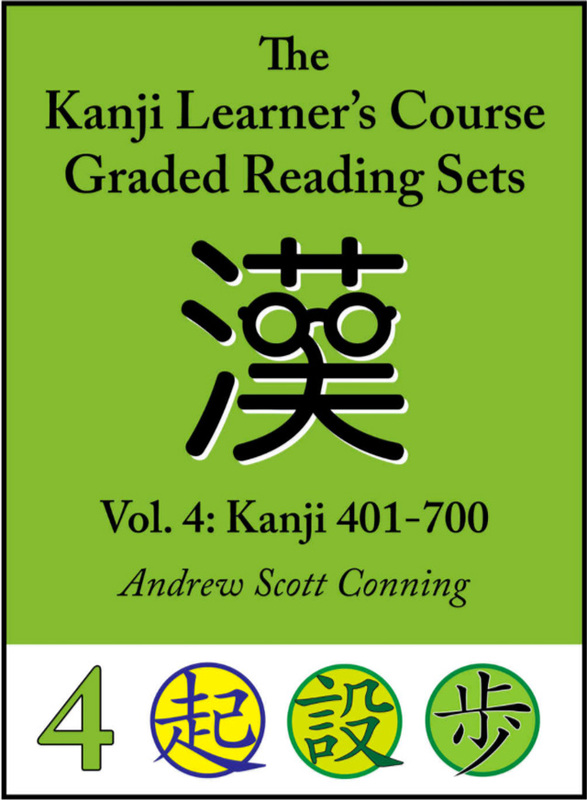 4 covers kanji 401–700 (way more than any of the others so far). Each sentence explains new grammar and gives pages from popular Japanese grammar resources for additional reading. 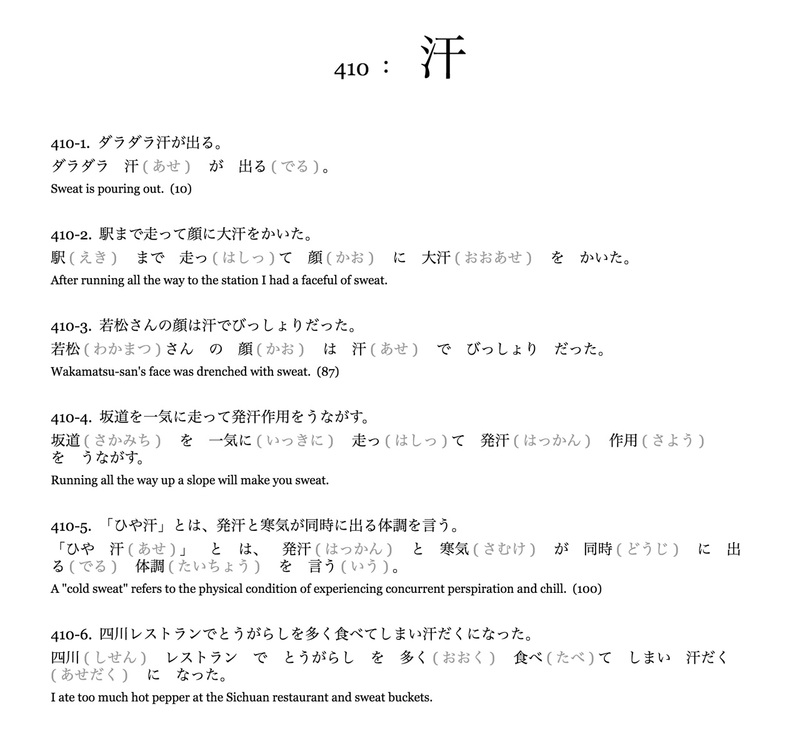 If you haven't yet jumped on the KLC train, remember the entire first Volume is available as a free Japanese learning PDF. You can check it out, decide if it's right for you, and commit after learning the usage and context for 100 kanji. Nice.